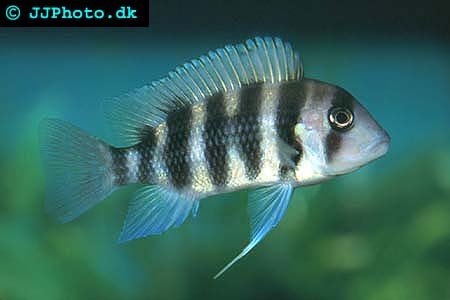 Company: Cyphotilapia frontosa (Frontosa) is best kept alone or with other large Lake Tanganyika cichlids. 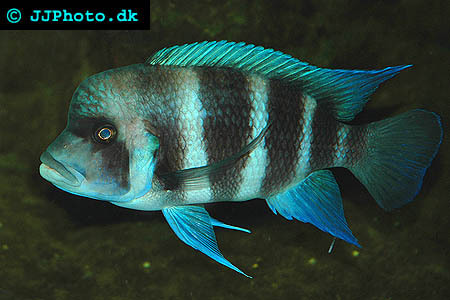 Aquarium setup: Cyphotilapia frontosa (Frontosa) should be kept in a large Lake Tanganyika aquarium. Decorate the aquarium with a lot of rocks placed in such a way that a lot of caves a created. The aquarium should be well filtrated. Feeding: Cyphotilapia frontosa (Frontosa) will accept pellets. They should be given a varied diet. Breeding: Cyphotilapia frontosa (Frontosa) are mouthbrooders. The female take the eggs in her mouth after the spawning and keep them there for about a month. The fry is quite large when they are released and will accept baby brine shrimp. Each spawning generates a relatively small amount of fry. You can reac more about breeding Cyphotilapia frontosa (Frontosa) in our articles section.